INSET: The elder statesmen of Albanian tattooists, Besnik Çela. 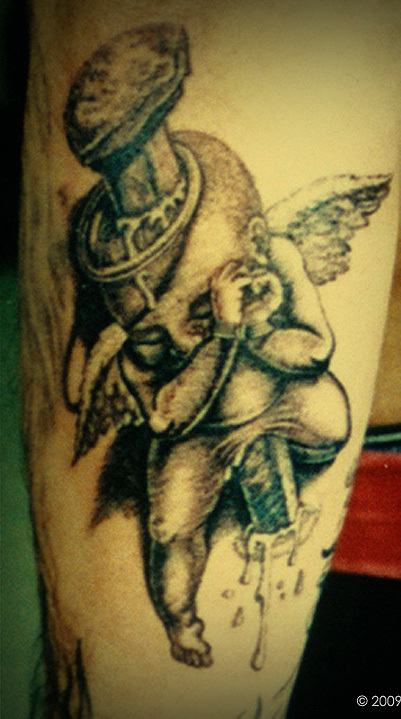 Like most tattooists around the world, Besnik’s first works were inked on his own skin. 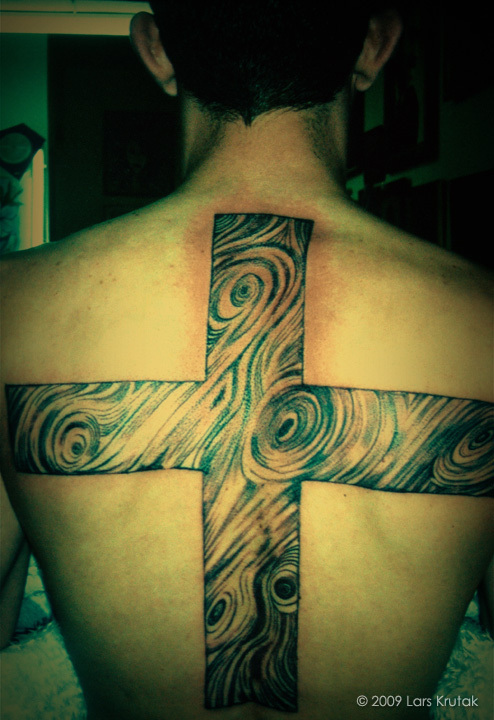 “I used a mirror to put all of these tattoos on my arms and it was difficult to do, but it was good practice.” His tattoos depict his ultimate passions in life including family, art, and notable hobbies. 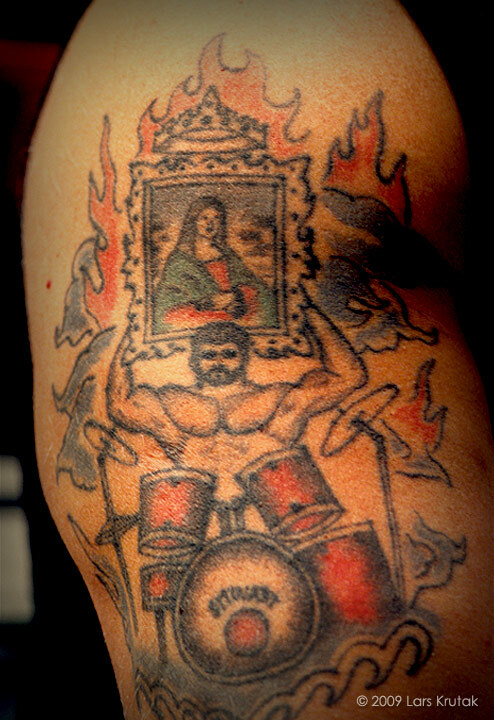 The Mona Lisa painting symbolizes his love for classical art, the drum kit (that includes his son’s name on the bass) his devotion to music, the Harley Davidson emblem his passion for motorcycles, and the man with a bulging mass of muscles? Well, I think you can guess that one! Besnik is not just Tirana’s only bodybuilding tattooist. 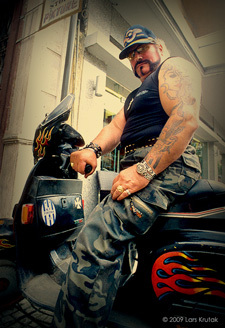 He is also a Vespa enthusiast and note the hand-painted design work on one of his favorite rides. Just a few blocks north of Mandi’s shop in the heart of Blloku is the tattooing sister tag-team of Enilda and Dea Dervishi. Eni, or the “short lady” as she is lovingly called, has the distinction of being the only female tattooist in Albania and like everyone else sinking ink in the city is an alum(na) of Tirana University’s Academy of Fine Arts. Her younger sister Dea applies temporary tattoos, a popular art form for youth and people heading to parties, and is learning to tattoo from her older sister. Eni expects her apprenticeship to last until this fall when Dea will start working on her own. Artistry appears to run in the family as both she and her sister are painters and their mother illustrates children’s books. 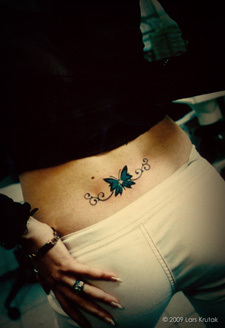 Eni has been tattooing for almost ten years now and she began her career with a homemade machine at the age of 17. Her progression to a modern machine took time because tattoo equipment is expensive by local standards and for Eni it was “heavy” in the beginning because she has small hands. Their basement shop is very new and they have only been established in the neighborhood for about two months. Their one-roomed studio is bright, cheery, and the walls are decorated with canvasses proclaiming the artistic prowess of these charismatic ladies. Because they are just getting up to speed on the new business location, they are still working on flash sheets and photo catalogues to display in the shop. At the time of my visit, I relied on their computer to get a sampling of their work which covers all genres, especially tribal and religiously-themed tattoos. Luckily a family friend and tattoo patron of the sisters was visiting the shop when I dropped in. Klodi, a member of Albania’s military, has a dagger tattoo inked by Besnik and also sports a couple of Solomon’s Seals on his back that Eni has been working on. 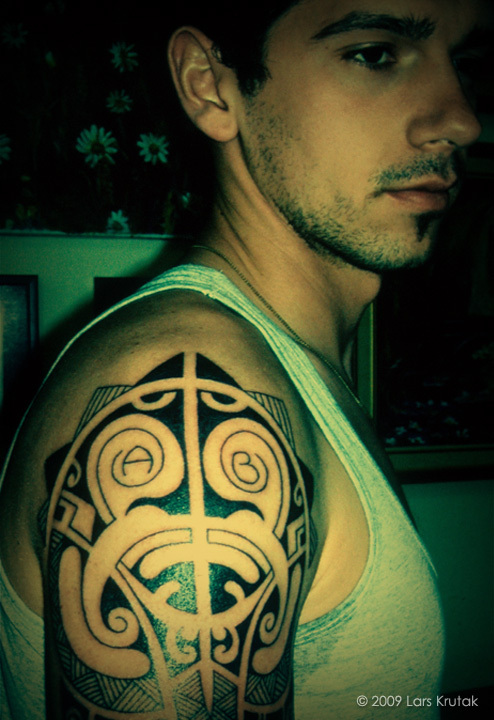 Klodi will eventually receive five more Hebrew “Pentacles of the Sun” which are related to his zodiac sign and are believed to hold magical properties. When completed they will take the shape of a cross. Following the global trend, the owner of Steelwings recently co-sponsored the 1st annual Chopper Convention and rally in May of this year. The event held in Tirana included a “Best Motorcycle Design” contest, live rock bands, and local tattooists. It was heavily attended, and so popular that another is scheduled for September. 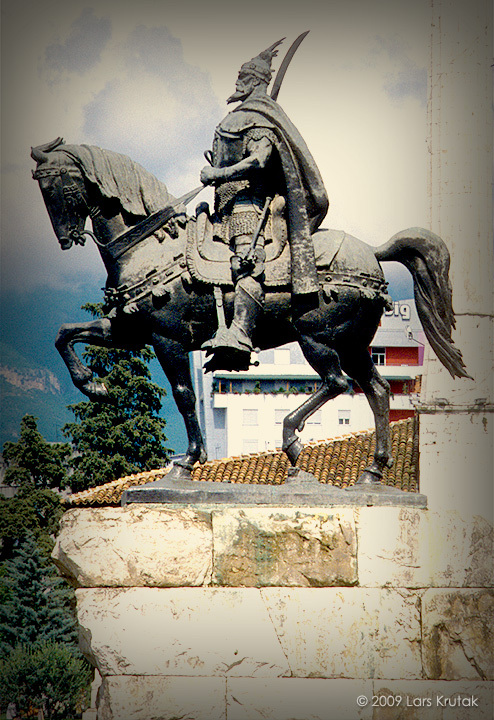 All in all I had an incredible time in Tirana, and I would highly recommend a visit to anyone traveling in Eastern Europe! Compared to the rest of the Continent, it’s relatively inexpensive because Albania has not yet converted their currency to the Euro and it is still opening-up to the rest of the world. Tourism is certainly on the rise and the country is incredibly diverse with majestic mountains, timeworn villages, pristine beaches, World Heritage sites, amazing ethnic food, local brews and wines. People are friendly and international, and they’ll show you a great time no matter what you are after. 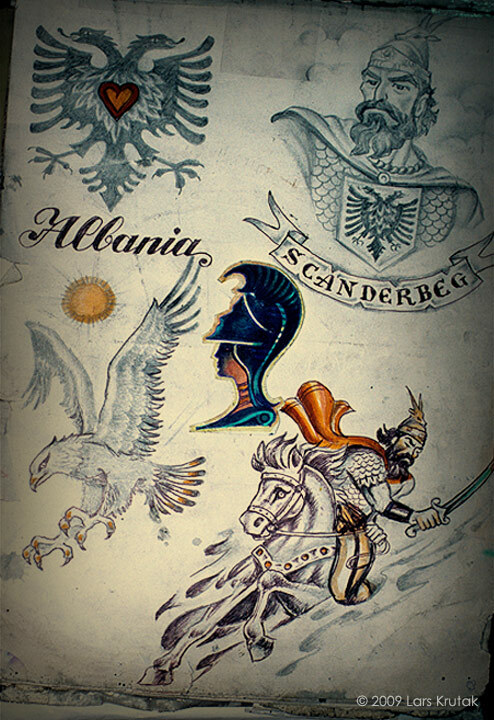 And if you seek a tattooed souvenir to permanently mark your time and experiences in the “Land of Eagles,” Tirana is definitely the place to be. As Besnik told me, “We are all artists at the end of the day, so if you come and visit us here I am certain you will receive a wonderful tattoo that you will be pleased to share with others.” I couldn’t have said it any better. Krutak, L. (2006). 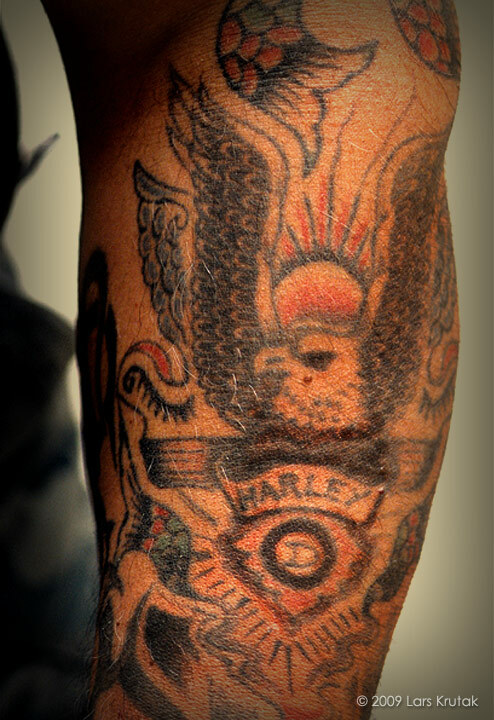 “Greece’s Oldest: Jimmy’s Tattoo Studio.” Skin and Ink Magazine, p. 14-16. February. (2003). “Landmines and Tough Times: Tattoo Art in Kosovo.” Skin and Ink Magazine, p. 61-67. July.